This 61 CPMY 1984/2009with 2009 Cummins QSL9-405 diesels has many features you will not find on other Hatteras vessels in her class. This stabilized pilothouse CPMY is adesirablethree stateroom threehead layout with a large full beam master stateroom with en suite head aft. She has been repowered with economical Cummins QSL9-405 MCD diesels, smartcraft monitors, electronic controls allowing longer distance traveling and effortless movement through out the engine compartments compared to the old style power plants. She also boast two generators, two dinghy davit systems, watermaker, custom welded frame and canvas top, custom upper deck extension, Stidd chair and custom towing bit, fresh varnish and full service on AC'S July 2017to name a few . Do not miss this rare opportunity to purchase a repowered 61 CPMY. Over $250,000 in upgrades.Click on full specs for more information. 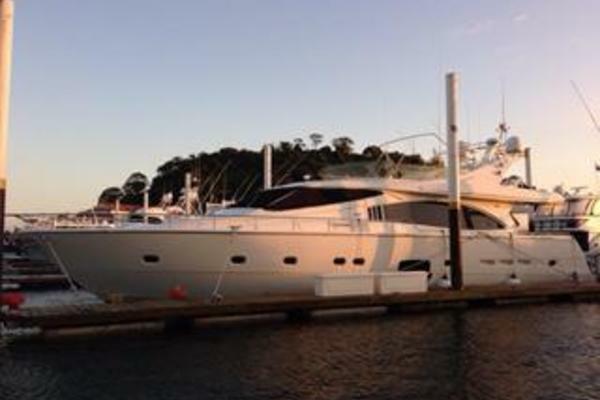 United Yacht Sales New Jersey would love to guide you through a personal showing of this 61' Hatteras Cockpit Motor Yacht Newer Cummins,stabilized 1984. 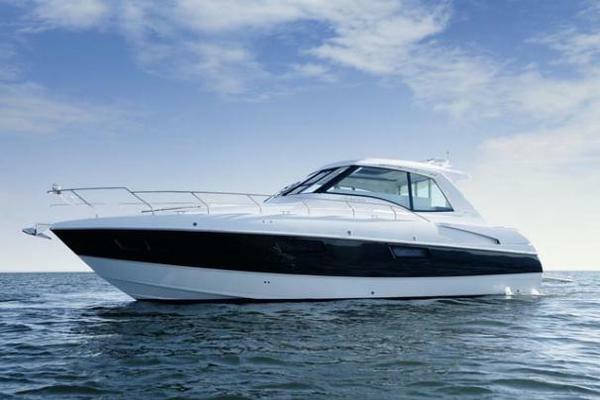 This yacht for sale is located in Vero Beach, Florida and priced at $359,000. For a showing please contact us by filling out the form on this page and we will get back to you shortly! The large full beam cockpit allows boarding by tender, swimming or dockside effortless. This area provides plenty of room for seating, fishing and storage. There is a cockpit transom door to port allowing easy access to the swimplatform or reeling one in. This cockpit also features a extended top and a tender towing post. Three stairs up and forward of the cockpit is the large aft deck. This semi enclosed area includes a wet bar, ice maker, table and chairs. This a great place to dine, entertain and relax. There are wing doors port and starboard allowing easy access around the deck, sliding windows port and starboard and double doors for access to the salon. The aft deck could be fully enclosed and air conditioned if one desired to do so. Forward from the aft deck and through double doors is the spacious salon. This elegant salon is light and bright due to the large windows and open floor plan. Plenty of rare imported wood and fine paneling with beautiful furnishings makes this area ideal place for socializing or watching a movie on the large sat flatscreen TV. The salon isseparatebut open to the pilothouse on the same level this isaccomplished by a combination divider. Forward on the same level of the salon is the Pilothouse. The pilothouse has sliding doors port and starboard allowing access to the main deck or for entrance if using a gang plank dockside. This area has comfortable recessed bench seating for two with large windows and plenty of flat surfaces for charts and navigating. The pilothouse is loaded with electronics and access to the electric distribution panel cabinets. 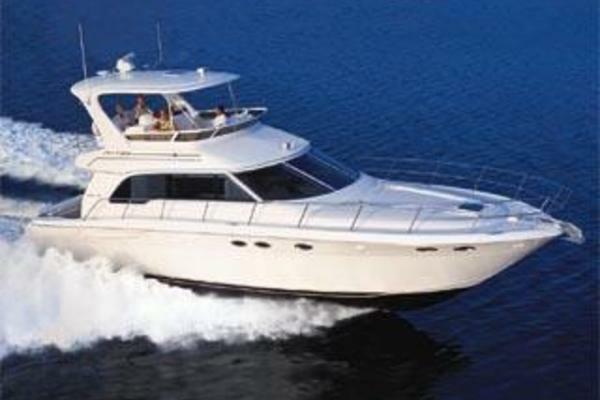 Forward and down several steps from the pilothouse you will find a full galley to port and dinette to starboard. The galley is exceptionally spacious with large counter space and full size appliances perfect for the chef to make gourmet meals. The dinette is placed adjacent to the galley with opposing seats with storage below. Plenty of room with lots of storage. All stainless steel appliances (New 2007). Forward of the galley is a spacious bow stateroom with two berths and a private head. All the way aft is a spacious master stateroom with a queen berth. This full beam stateroom allows room for hanging lockers and built-in chest of drawers. The master head is built for luxury. The head is equipped with a tub with shower and plenty of storage for linens and toiletries. Forward of the master stateroom down the companionway is the guest stateroom to port and guest head to starboard. The companionway also has a linen locker and a washer and dryer (New 2007) in a locker to starboard. Several steps up from the pilothouse is a large flybridge with a custom welded aluminum framed canvas top and extended deck. There are two dinghy davit systems port and starboard, 12' Caribe tender w/ 40 hp, Stidd chair and full electronics. Under the galley floor through a large access hatch is the generator room. Forward down the companionway of the master stateroom are the stand-up height port and starboard engine rooms that provide easy access to the Cummins diesels. This compartment makesmaintenancea breeze since thenewer Cummins take a lot less space then the older Detroit diesel version.